This classic post was originally posted in April. Enjoy! Particularly on Main Street, but elsewhere as well. 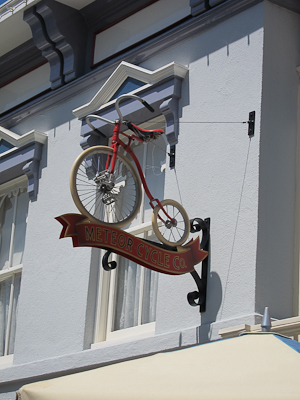 Disneyland has all kinds of cool details that I really never paid attention to since I was trying to get on a ride or go see something in particular. So, here’s a post about looking up. Main Street, U.S.A. is supposed to be a typical main street in 1908, except it would have been a very crowded main street because there’s all kinds of stuff on there. And also, Main Street is not very tall. I knew that it had been scaled down, but I couldn’t quite figure it all out because the upper windows seemed to be somehow even more scaled down than the rest of the street. Which, REALLY??? I mean, when even GOOGLE has to guess, you know that’s some top secret information. And also, there’s an entire website devoted to celebrity’s heights? Okay, I’m getting way off topic here, so let me just throw you a picture real quick. 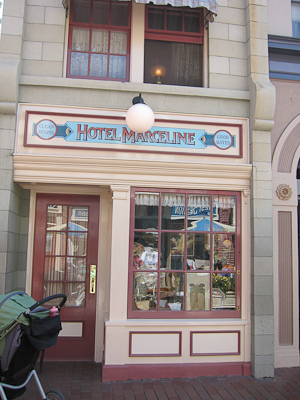 This is a fake building with a door that doesn’t open named after Walt’s hometown of Marceline, MO. That’s also our stroller. 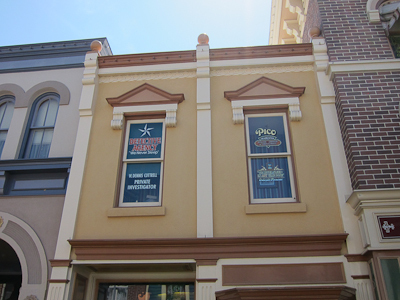 Buildings along Main Street are built at 3/4 scale on the first level, then 5/8 on the second story, and 1/2 scale on the third—reducing the scale by 1/8 each level up. And even though I know that Wikipedia is totally the best source for reliable information of any kind, it pretty much makes sense to me. Although neither Wikipedia nor Google has any information about Main Street’s height in relation to Elijah Wood. Somebody should write a blog entry about that. Or make a whole website. Or just take a picture of Elijah Wood standing on Main Street in Disneyland. Next to Gandalf. Because that would be awesome. Anyway, there’s a particularly large number of looking-up things in the alley behind the fruit cart by the lockers. 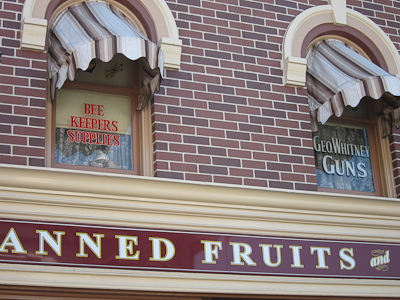 Apparently Walt used the upper windows to commemorate his friends or Disney employees or Disney employees who were also his friends, or some other people he would probably be Facebook friends with if he were still alive today, and using the internet at 110 years old. I mean, I think that might even be more awesome than a picture of Elijah Wood and Gandalf on Main Street. Tangent: I remember a couple of years ago the news did an interview with the oldest woman in the world and when they asked her the secret to her longevity, she said, “Bacon.” Dudes, I’m totally not kidding. And thank God for that, because given the amount of bacon I eat, I’m going to live forever. More friends of Walt’s, I assume. 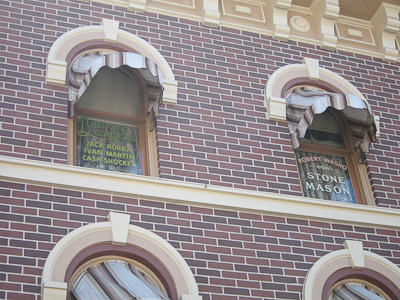 I wonder if the “Stone Mason” carved Walt’s head stone, or just the ones in the Haunted Mansion queue. 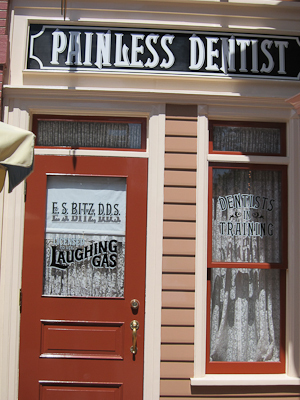 I think my favorite is the Painless Dentist. Laughing gas in 1908 from dentists in training? Sign me up! I like the “S. E. Bitz” name. Is that really someone’s name, or a play on “Yes, he bites”? Seriously, if you know the answer, leave me a comment. You can also buy a bicycle. 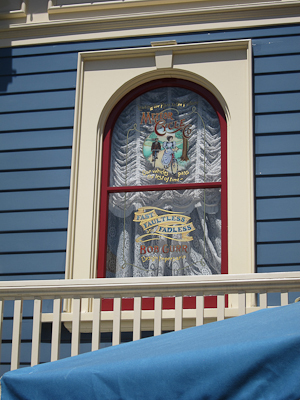 This window is one of the few with an actual colored picture. And here’s another interesting one. That’s all I can think of to say about this. I think I’ll make looking up one of my new hobbies. When I’m not riding my bicycle down Main Street. *Edited to add–a reader let me know that according to imdb.com, Elijah Wood is indeed 5’6″. But I still want to see him standing on Main Street with Gandalf.